We’ve been reading an interesting and original book*, by an academic at the University of Arizona, about how the art and culture of local groups in some of Rio’s poor favelas interacts with urban change there. It’s rather hard work at times, written as it is in the language of the academy: ‘the production of other forms of knowledge that may challenge hegemonic notions, denaturalizing a spatial order that has legitimated and justified regimes of exclusion and inequalities’ is far from the only example. But it does offer a fascinating combination: careful tracking of neighbourhood-level cultural production, alongside a sharp analysis of the processes and purposes of Rio’s remodelling. The context is in many ways familiar: Brazil, Rio de Janeiro and the favelas are part of all our consciousness, with a strong image mixing race (the Afro-Brazilian mingled with the Portuguese colonial), popular culture (futebol, samba, capoeira, Carnival), the city of Rio (Sugar Loaf, Ipanema), and the favelas themselves: already on the ‘edgy tourism’ trail, as author Bezerra points out. “Sim, as favelas” Who lives there, how are they perceived, and what does government – national and municipal - see as the necessary response to conditions there? The book covers a complex history of interventions. Some were relatively conventional, such as the Growth Acceleration Programmes (PAC, PAC-2) with infrastructure improvements, social programmes and new facilities. 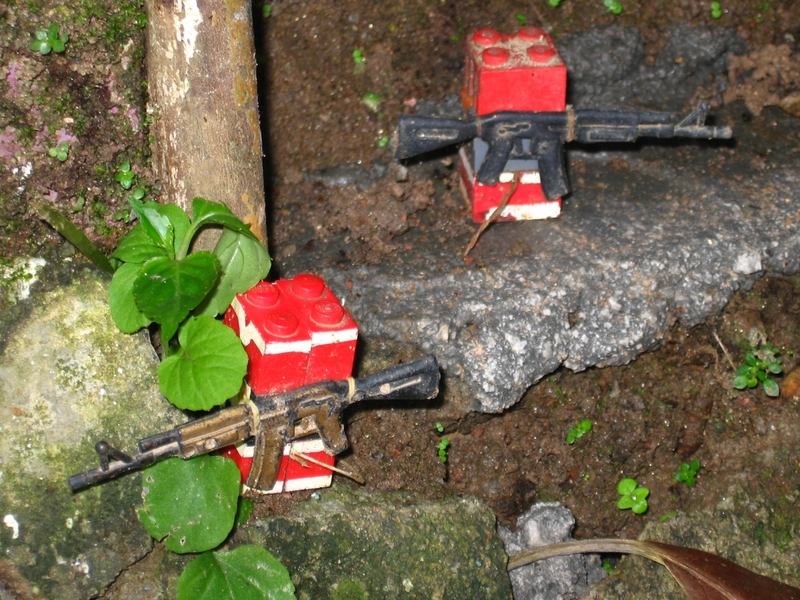 Others were heavily-armed operations by the police and military, aimed at taking back control of areas from drug cartels. These were often perceived (for example in the Complexo do Alemão) as ‘invasions’ – not surprisingly, given that the police special ops unit raised the national flag at the Morro do Alemão hilltop when it was retaken! It’s a great contrast: the state and media using the flag image ‘as a token of the state’s successful strategy against the drug dealers’, and the parallel local resentment of ‘the representation of the favelas as unruly / enemy territory that need to be conquered by force’. This duality runs through the narrative. Yes, the favelas are often poor, insecure and dangerous, with many development needs. But no, an entirely top-down set of responses is not enough. The cultural and artistic creation that the book describes is primarily a response to that mismatch. For Built Environment readers, many of the planning and urban development aspects of the story will be all too familiar. Alongside the old port in Rio, the Conceição area is a long-established and characterful low-income district, very stable but intermittently gang-controlled. It is now part of a dockland redevelopment project – Wonder Port (!) – straight out of the dockland regen playbook, where ‘regeneration’ is more about exploiting the site than integrating the communities. Two of the cultural products described – a 2012 short film screened at various film festivals, and an O Globo news video – attempt to question the state’s ‘renovation benefit’ logic: as does the ‘Inside Out’ project created by a French film artist/activist, which worked with twenty local women who had lost relatives to drug violence, and sought to involve young residents of the Providência favela in workshops on photography and graffiti. Familiar too will be the introduction of eye-catching (‘iconic’, surely) projects, such as the cable car to and through the Complexo do Alemão. Aimed partly at ‘normalizing’ favela life with better transport, but also at contributing to the Rio brand (and 55% of users are reported as being tourists; the reader is delighted to see that Prince Harry was among them a few years back), the cable car features huge boxy stations in the midst of / above the packed and stacked favela houses – stations which do, however, feature locally-made art works, referencing community concerns and pride; stations whose initial ‘catalytic’ effect seems to have mainly been a proliferation of home-made bars and snackeries perched precariously on the slopes opposite the station exits. At the heart of Bezerra’s examination is a detailed look at a series of locally-based cultural outputs: photography; video; posters; mosaics; exhibitions; the station art; websites; workshops, training and community engagement in all these media. They include the astonishing ‘Projeto Morrinho’ model of a favela which features on the book’s cover – made and maintained by a score of youths from the Favela do Pereirão and used for play and social commentary about favela life. A replica of the model is in fact displayed in the courtyard of the MAR museum – a cultural project also analysed at length, and judged to be a missed opportunity in terms of promoting ‘other ways of seeing’, because it is in essence ‘a key component of place consumption’. 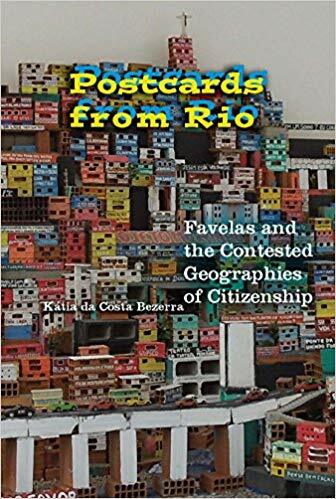 The PAC/PAC-2 initiatives, and their degree of engagement with the people of the favelas, are something of a test-case for the book’s exploration of the role of the artistic/cultural effort. Early on, Bezerra presents the photo exhibitions and videos as an attempt to make residents' voices heard, and then she goes on to say that community consultation was mandatory for PAC projects to get financing. But a few pages further on, we learn that the community involvement aspect was circumvented (perhaps because of out-of-step timings?). This felt slightly glossed-over. Particularly given that somewhere along the line someone (the Lula administration? the Rio mayor before Paes?) seemed to have tried to ‘do the right thing’, only for the community to apparently be finagled out of any involvement by (was it?) the private companies who won the contracts. Based as it is on the context of regeneration and on the analysis of the art work in the favelas, Postcards from Rio contains a wealth of reflection: about city image, about tourism and its consumption of poor folks as a spectacle, about gentrification, and about the possibilities for favela residents to play a greater part in determining the future of their neighbourhoods. Perhaps the big question that remains at the end, though, is one of impact. The artworks may have – and indeed often do seem to have – raised local people’s consciousness about what was being done to them, and what they might do about it. In only one of her examples, though, does the author evidence an outcome where the efforts seem to have produced a different result: saving some buildings and businesses, and realigning the tram route, in one part of the Wonder Port project. Maybe seeing the efforts as ‘part of a process of empowerment and coalition-building’ is mostly what it’s about: the ‘alternative ways of seeing’ that the artworks help with are, then, part of the background to a more confident and informed local population. Impact or not, the stories and argument add up to a real contribution to thinking about urban change, those who trigger it, and those who experience it.